Abstract: In order to investigate the brittle failure of key-hole-notched components, the stress distribution at notch tips is studied numerically and theoretically. A semi-analytical formula is developed for the maximum notch-tip-stress, incorporating crack-tip-blunting, stress-concentration and stress-equilibrium. Stress distributions in notched plates are simulated by the finite-element method, showing improved accuracy of the formula relative to established solutions. 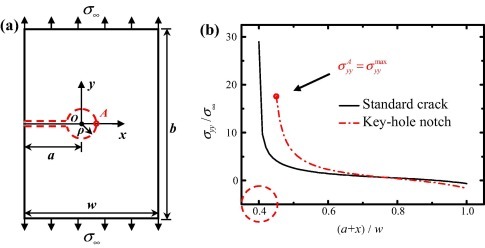 Application of the developed equation to components containing U-notches and blunt V-notches, is explored, demonstrating its broad applicability. When combined with stress-based failure criteria, the semi-analytical model can be employed to assess brittle failure in notched components with significance toward fracture in heterogeneous materials. This entry was posted in Publications and tagged FEM, porous media, publications, research. Bookmark the permalink. Post a comment or leave a trackback: Trackback URL.